"I'm very sick and may die soon, but the thought of all of you waiting for my death just to inherit the money makes me even sicker. None of you ever cared for me, or showed that he knows what I care about. So why should you enjoy my money? I have therefore decided to give all my wealth except for a small portion away next week, so that I can live my remaining days in peace with none of you near me." There is quite some murmur from the relatives. "Don't fret. I give all of you a chance and it might very well be that I give all my wealth to one of you. Now listen." The room becomes very quiet. "All of you are going to give me a gift tomorrow. I will evaluate all of them for a day, and then decided if what you gave me is of any value. If a gift can really, really please me, I will give the one who gave it to me all my money. Now go and return tomorrow." All the relatives hurry away. The next day, they queue to give the billionaire all sorts of presents. Gems, famous paintings, even some sport car and a voucher for a world-trip by balloon... The billionaire takes them without comments or gratitude and hushes the relatives away, telling them to return the next day. "As I had expected, your presents were all junk and worthless to me. Why the hell should I want to freeze to death miles high in the sky or crashing on the motorway? And were should I place those tasteless paintings without having them in my face all the time? Na! I was ready to donate all my wealth to the Puzzling.SE online community, the only people sharing my interests, hadn't I received this..."
And with this he shows a little necklace made from cheapish plastic pearls on a Nylon string. "Whoever gave me this, will be very rich by next week..."
Can you explain, why this present did so appeal to the billionaire? The make it a bit easier: The solution requires looking at the necklace in clockwise direction. And, of course it is an encrypted (English) message with a twist. The twist needs to be named in the solution. Black edgy pearl vs rounded pearl is a bacon cipher that decodes to "color" meaning to look at the pattern of colors. Black pearls vs white pearls is a bacon cipher that decodes to "graynext" meaning to check black vs gray next. Black pearls vs gray pearls is a bacon cipher that decodes to "cyannext" meaning to check black vs cyan next. 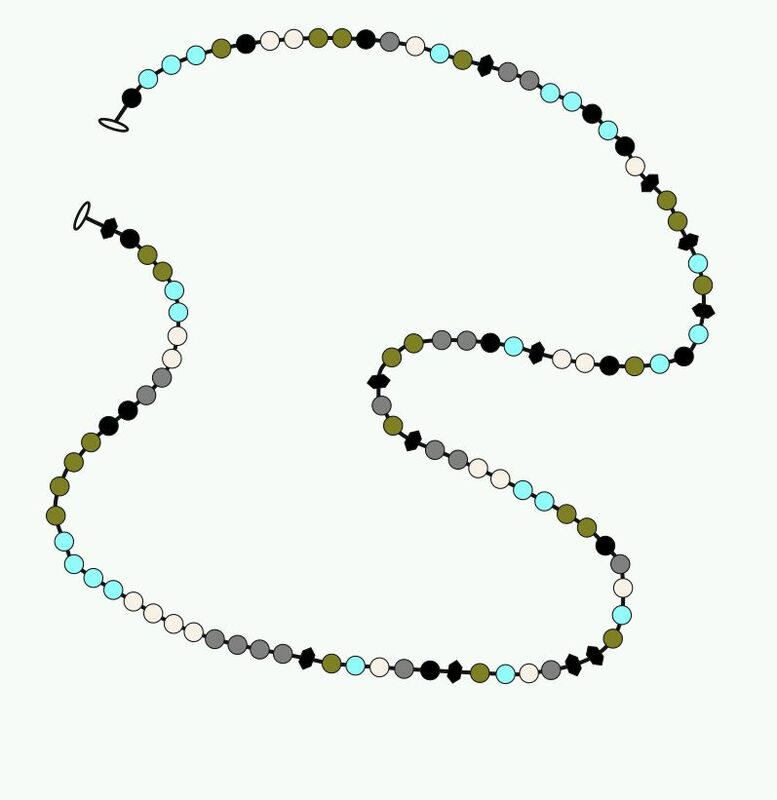 Black pearls vs cyan pearls is a bacon cipher that decodes to "olivenext" meaning to check black vs olive next. Black pearls vs olive pearls is a bacon cipher that decodes to "linennext". The color code for white, #FAF0E6 is actually the code for the color "linen", so when you're comparing black and white, you're really comparing black and linen and get gray which repeats the cycle. This is not a complete answer, but it might help to solve it. Black gems are baconian cipher. Black and white gems are baconian cipher. Info: Last two gems(00) are out of the context. Not sure how they are related.